The University of Wisconsin – Waukesha is a small university campus outside of Milwaukee. 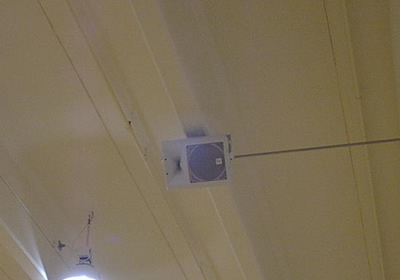 When they remodeled their field house they needed an updated sound system. The room is large, boxy and has only a small amount of absorption panels hung on the walls. Rather then a center speaker cluster, a design approach was used which distributes eight speakers throughout the room. This way, anyone in the audience is much closer to a speaker and clarity and intelligibility is dramatically increased. The system also uses presets to increase intelligibility. In different room use modes, different speakers will be turned on or off and different delay settings selected. A multi-position switch is used to select from several room set up presets. 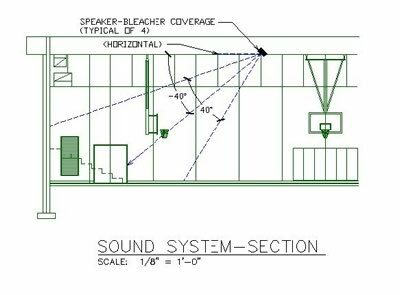 The first preset is for basketball games, where the row of speakers which covers the basketball court is muted and the row of speakers which covers the bleacher is turned on. In the second preset mode, the speakers cover the whole room evenly. This preset mode is used when a microphone is in the middle of the room. 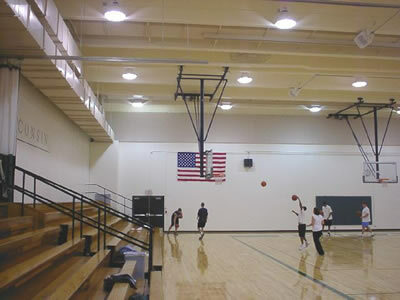 The third preset mode, is used when a stage is set up in the front of the room (opposite the bleachers) or for dance classes, where the instructor is in the front of the room. 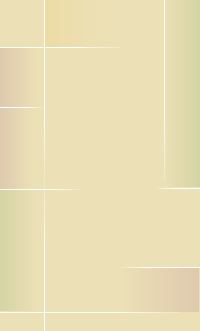 This preset mode is used when a microphone is in the front of the room. The first row of speakers is on to cover portable seats of dance class participants who are on the court area. The second row of speakers, which covers the bleachers, is delayed to time match the front speakers. A roll out portable rack is used for dance class equipment. It includes an additional wireless head mic, a CD player, a Cassette payer and small sub mixer. This rack simply plugs into a wall plate at the front of the room. Copyright © Lipp AV Design, Inc.